Exclusively designed and filled with gourmet sweet treats piled high and topped with a hand-tied bow, this Tower of Treats® Gift is sure to delight. 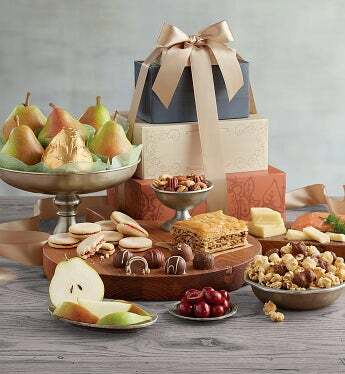 Among the goodies inside are handpicked Royal Riviera® Pears and Moose Munch® Gourmet Popcorn. Signature includes: 6 Royal Riviera® Pears, approximately 2 lbs. 3 oz. ; Milk chocolate Moose Munch® Gourmet Popcorn, 10 oz. ; Mixed Nuts (Almonds, Cashews, Hazelnuts, Pecans, Walnuts), 4 oz. ; Chocolate Cherries, 3 oz. ; Signature Truffles (Coffee, Cherry, Raspberry, Almond, All Dark, Double Chocolate), 4 oz. Total Net Weight: 3 lbs. 8 oz. Deluxe includes: 6 Royal Riviera® Pears, approximately 2 lbs. 12 oz. ; Milk chocolate Moose Munch® Gourmet Popcorn, 10 oz. ; White cheddar cheese, 4 oz. ; Smoked Salmon, 6 oz. ; Mixed Nuts (Almonds, Cashews, Hazelnuts, Pecans, Walnuts), 4 oz. ; Raspberry Galettes, 5.25 oz. ; Baklava, 5 oz. ; Chocolate Cherries, 6 oz. ; Signature Truffles (Coffee, Cherry, Raspberry, Almond, All Dark, Double Chocolate), 4 oz. Total Net Weight: 5 lbs. 8 oz.